Tetrao urogallus (Linnaeus, 1758) wood grouse; glykhar (rus), glushets (ukr) Wood Grouse is well known game species in this region in past. In 1990s it was listed in the Ukraine Red Data Book register. Main threads to the species included: disturbance, habitats destroy, fragmentation, other. 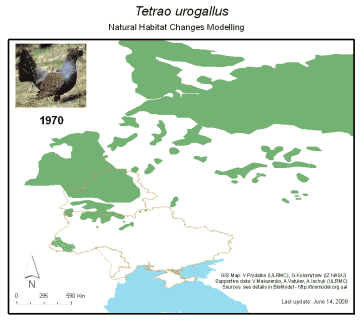 This BioModel post presents at first a reconstruction story concerning T.urogallus natural habitat changes in GLOBIO Ukraine Region and outskirts in ‘1970s-2006s′. For the purpose we incorporated maps and data of more then 13 sources to ArcMap-GIS. New GLM scenarios demonstrated serious erosion of the species habitats and its ‘migration trend’ to the ‘NE’ direction by 2050 (see the gif-animation). Read more about other bird species trends in the summarized table using BioModel web-page. (Our list of modelled Galliformes includes also Lyrurus tetrix (Linnaeus, 1758)). BioModel produced also the first educational animated story about historical natural habitat changes of the species during ‘1970-2006′ – see t_urogMOVIE. The supportive picture shows a rare historical map of 70’s on location of game-bird-species in the former USSR (1973), that we reconstructed by BioModel-team in GIS environment. The diagram reflects local statistics vision, which is based on data of Ukraine ministries and committies, and our view on possible ln-trend of the population. Map of the USSR European Part Vegetation, M1:4,000, 000, drawn up by Prof. J.Kuznetsov (1928) – Rus. [The map was granted by the Vernadsky National Library (Kyiv) – vectorization made by V.Prydatko, A.Ischuk, Y.Apetova, A.Kalynychenko (ULRMC)]. Forest Game Birds and Animals/USSR Forest Atlas. 1973 – Rus. [The Atlas was granted to the EEBIO Project by the Vernadsky National University Library (Kyiv); vectorization by V.Prydatko et al. (ULRMC)]. BioDAT (by A. Puzachenko). 1980s – Rus. Ukraine Forest in 2000’s based on Landsat Data (ULRMC, 2005). 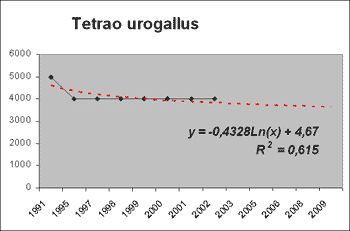 T.urogallus/Red Data Book of Ukraine (1994) – Ukr. Digital Ukraine 1:500.000 (ДП-МЦЕК-МНС, 2001). Statistics Bulletin. About Protected Areas Fund of Ukraine in 2002 (the form #1-zapovidnyk). Kyiv: SSCU, 2003.- 171 p.
Key Bird Areas in European Russia (2000) – Rus. Prydatko V. About food web of the Carpathian wood grouse in the game-area ‘Majdan’. Thesis for 7th All-USSR ornithological conference. Alma-Ata. 1978. p.54. –Rus.